Death By Oreo Cupcakes. The most ridiculous cupcakes I have ever made. I call these Death By Oreo Cupcakes because there is one (mega stuf!) oreo stuffed in each cupcake and then lots of crushed oreos in the frosting. OreoMANIA. These cupcakes are all kinds of delicious. These are really for the true chocoholics (ME!). If you love oreos, you will absolutely love these. When they first come out of the oven, the oreo is sooo soft and just melts in with the cupcake. OMG. So good. After they cool, the oreos do start to firm up a bit, but they do stay slightly soft. 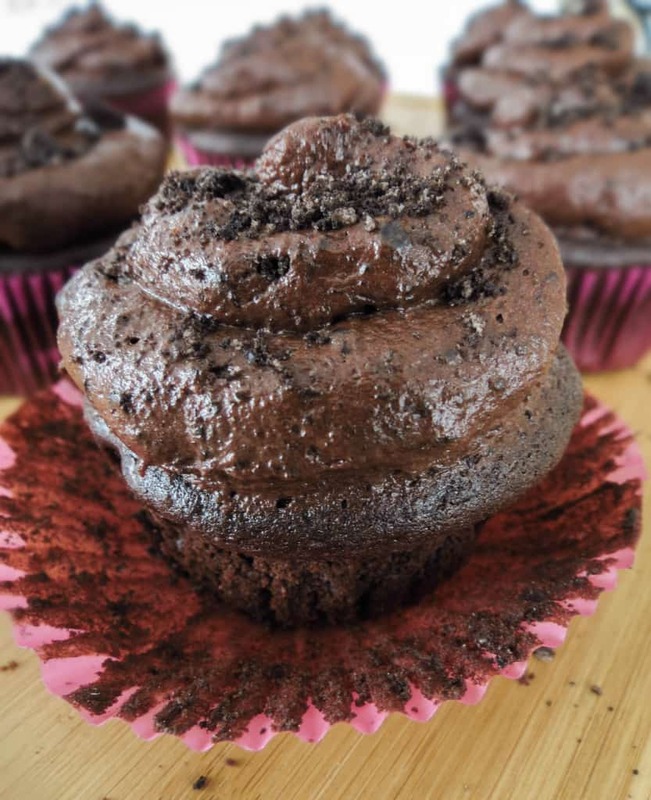 I developed this recipe trying to create a super moist chocolate cupcake with a light crumb. That does sound like the perfect cupcake right?! Well, no need to look anymore everyone, these are, in my opinion, the best! I have another chocolate cupcake recipe on here, but I did not develop it myself. This one, I developed completely on my own. The sour cream, buttermilk and oil all work together to make these supremely moist and light. I like to use oil instead of butter in most of my cupcake recipes because I feel it makes for a lighter cupcake. The hot coffee brings out so much chocolate flavor. I didn’t want it to be too overpowering, so I only used 1/4 cup and for the rest of the liquid I wanted to use, I used buttermilk. The frosting is absolutely to DIE for. It is super rich and chocolatey and just so rich and delicious. I used a mixture of bittersweet and semi sweet chocolate, but you can just use semi-sweet or whatever your favorite chocolate is, use it. I crushed about 1-2 cups of oreos super fine (I really wanted to taste them) and mixed them in. Let me tell you. This frosting really hits these cupcakes out of the park! 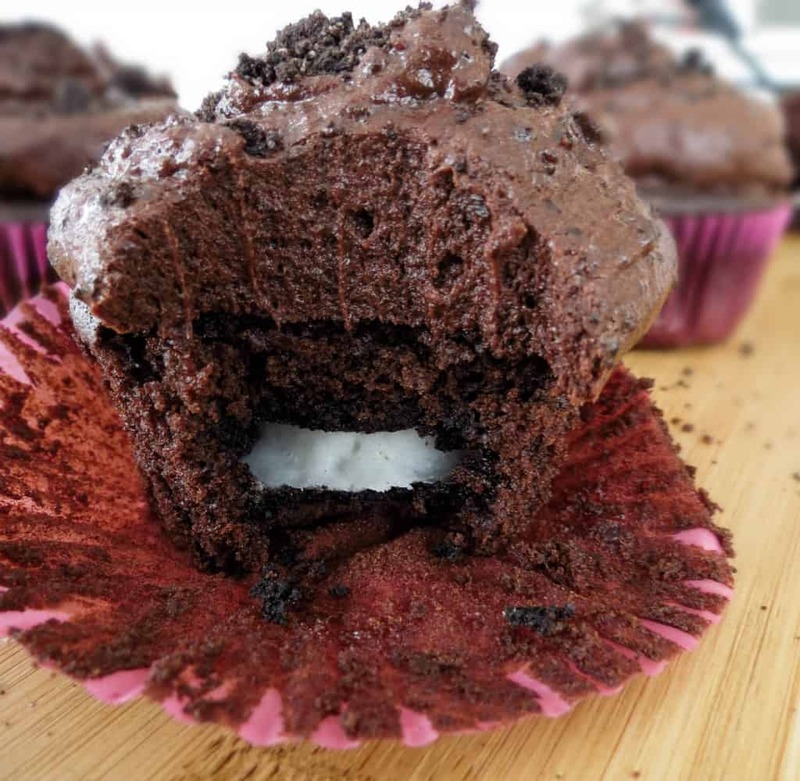 It’s the perfect finishing touch for this oreo stuffed cupcake. 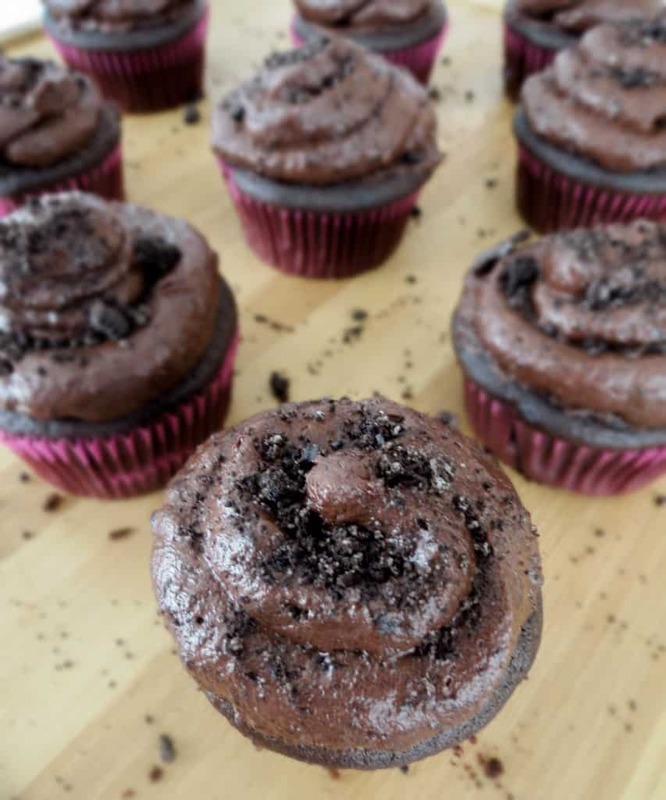 If you don’t like oreos and just want a classic chocolate cupcake and frosting, you can totally omit them throughout the recipe. I made a few to see how they would come out without oreos in them, and they just have a more domed top than the ones with oreos in them. Either way, you are putting frosting on them! Or don’t. I had a few right out of the oven without frosting and they were just as great. 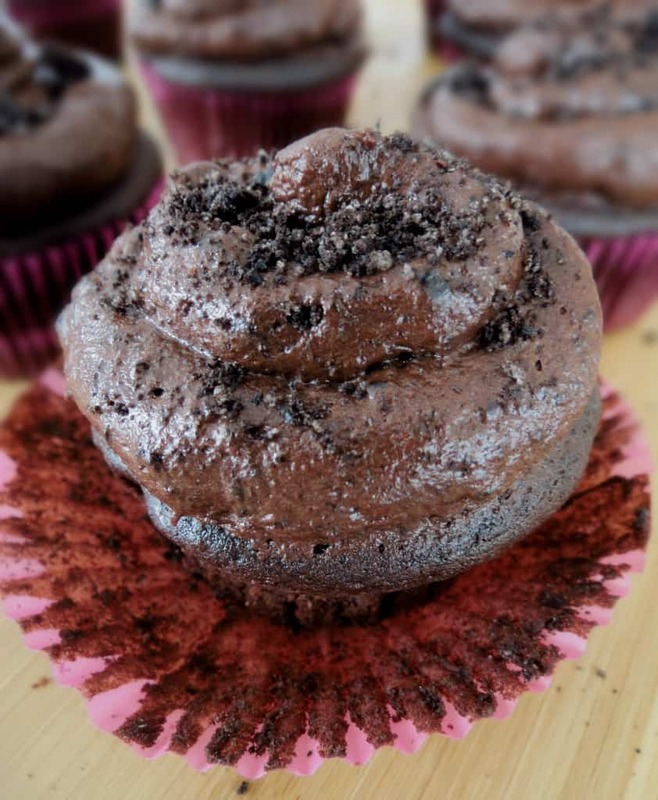 If you are an oreoholic + chocoholic, these cupcakes have your name written all over them! 1. Preheat oven to 325°. Line a muffin pan with liners and set aside. I used paper liners, but I would recommend using foil liners because the bottoms get a bit greasy (the cupcakes do NOT taste greasy). 2. In a small bowl, whisk together flour, cocoa, baking soda, salt and sugar. 3. Whisk together the oil, vanilla, sour cream and eggs. 4. Pour in the buttermilk and mix until combined. 5. Chop up your bittersweet chocolate and pour hot coffee over it. Mix it up until chocolate is completely melted and pour into batter. 6. Add in the flour mixture and mix until incorporated. Don't over mix. 7. Scoop a dollop of batter into each of your prepared liners, spread out and place an oreo on top. This is just to create a place for the oreos to sit on. Finish by covering each oreo with more batter 2/3 to the top. 8. Place cupcakes in preheated oven and bake for 17-20 minutes or until cupcakes are set and firm to the touch. While cupcakes are baking, start preparing frosting. 1. In the bowl of your stand mixer, cream the butter, corn syrup and cocoa powder together. 2. Melt your chocolate. Mix in chocolate and vanilla. 3. Add in powdered sugar and whip frosting until light and fluffy, about 3 minutes. 4. Crush up your oreos very fine either in a zip top bag or a food processor. Fold them into the frosting by hand with a rubber spatula or spoon. Adjust amount to your liking. I used about 1 1/2 cups, you may want more or less. 5. Once cupcakes are done and cooled completely, frost your cupcakes and enjoy! I would LOVE to try this!! I am oreo obsessed!! This looks great!! Thank you! So am I!